Finally, after a long delay, these customizable kits for motorcycles are available again! 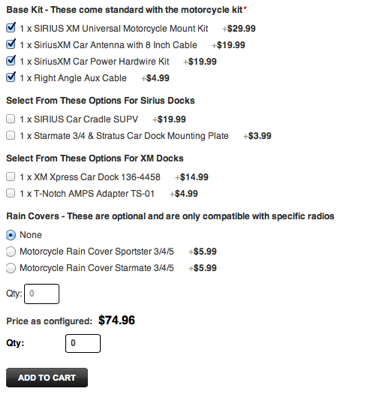 As you’ll see in the video below, you can ride in style and enjoy SiriusXM at the same time. These kits are now available with tons of options, and you get to choose which parts you want as shown in the image below. Some of you may be aware that the kits were out of stock for a long time and are in limited supply. We just got these kits today so head over to our order page and pick a couple up while you can. The page is available by clicking this link or the image below.